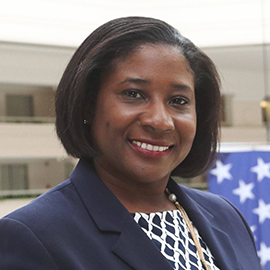 Aimee Griffin is the principal for The Griffin Firm with offices in Washington DC, Upper Marlboro and Baltimore, Maryland; Atlanta, Georgia and Durham, North Carolina. All the employees of this small firm are African American women including five attorneys. The commitment to empowerment through education is demonstrated with article contributions to the Washington Informer, Atlanta Voice and Triangle Tribune in addition to providing seminars for the Black banks, namely Industrial, Harbor, Citizens Trust and Mechanics and Farmers. Aimee has created the Association of Black Estate Planning Professionals. This nonprofit hosts the annual Creating a Legacy Financial Summit & Conference with the five partnering Black banks and the US Black Chambers.